Using a public folder to share a Contact List to Outlook, iPhones, and Android smartphones. If you have a contact list located in an Office 365 Public Folder, this step by step guide will show you how to sync a public folder to one or more users in your Office 365 tenant. If you would like to watch a video of public folder contacts sync, click here.. If you would like to try this for a single user, watch this CiraSync Personal Edition video.. The following procedure assumes that you have already setup CiraSync Enterprise Edition with appropriate permissions. To start the sync operation, login to your CiraSync tenant dashboard, click the plus sign (1) located in the Contact Lists window. Select the source of contacts, in this example, we will use Public Folder as the contacts source. In step 1 of the wizard, you will select the source Public Folder. 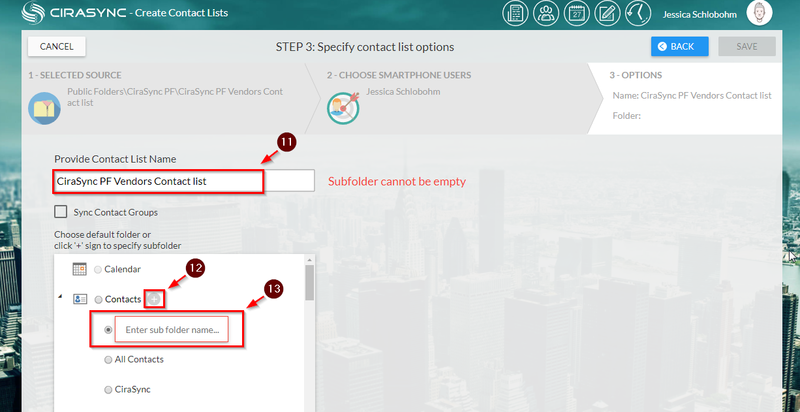 You will have to navigate to the proper subfolder (3) and click the radio button next to the specific contact list folder (4) then click Next (5). In step two of the wizard, you will choose the targets. A target is one or more mailboxes. You can pick specific mailboxes from the GAL, or you can use a GAL Distribution List, or you can use a Collection. A Collection will allow you to combine one more GAL groups, one off recipients and even exclude specific users from a group. Use the Collections tab if you want to push contacts to a collection of users. Select Search tab if you want to add an individual user, All Mailboxes or All Contacts. In this example we will use a single user as a target. Click on Search (6) tab. In the edit box, enter the name of a user mailbox (7). Last, click the plus sign (8) to add it to the list of targets on the right column of the wizard dialog. The selected target user account (9) will be added to the right-hand corner display window. Choosing to save the list to the default Contact folder is not recommended. A subfolder will keep each user’s personal contacts separate from the replica of the public folder contacts. In this example, we will create a subfolder. Next click the plus sign (12) next to Contacts then Enter the subfolder name… (13) of your preference. You will see the sync summary (15) from this page, it is also showing the contacts source and the target users. Now click on the CiraSync icon (16) located at the upper-left hand corner to go back to the main dashboard and run a manual sync. There are two methods in running a manual sync, first, you can click on the Sync Now button located at the upper-right hand corner of the page to force a sync operation for your entire tenant. Since that could potentially take hours, a second method is to scroll-down at the bottom of the dashboard to the Mailboxes grid. Search for the name of the target mailbox you specified in step (9). If the mailbox is not licensed, first click on the license button so it is green. Next, right click on the row of the target user mailbox(17) and select Run Mailbox Sync (18). You will see the progress of the sync from CURRENT TASK (20). Synced operation is showing completed (21). Now you can check the target mailbox (and subfolder) for the sync replica of the public folder. You should also see these contacts on the smartphone for that user. How often does a sync occur? There is a schedule setting for the entire tenant. We suggest you have this sync task run once a week on Friday evening. This particular update does a full synchronization — every contact in the source public folder is compared to every contact in every user’s contact folder. It can take several minutes. However, after the first full sync, incremental updates are done much more frequently. The source public folder is checked every 15 minutes for changes. If a contact change is detected, CiraSync will visit every target mailbox and make that one change. This includes adding and deleting contacts.